I received a sample product in order to conduct this review, and all opinions are my own. We are smack dab in the middle of summer time and that means hot hot hot days!!! My boys love to be outside and they love popsicles, ice cream and other frozen treats.. (What kid doesn't?) But, I am always really concerned about what they are eating and what all those sugary frozen snacks actually have in them. Lucky for me, these new Minute Maid Juice Bars are a yummy frozen treat that I can actually feel good about giving to my babies. They are 100% juice, which I love! They come in three different flavors: Orange, Grape and Cherry, and they are delicious! The boys have been gobbling them up left and right, and I can't blame them! I tried one too, and they really hit the spot on a hot day! Each box comes with 12 bars, which is a great deal! That is enough to last my boys at least a week or so, and that is if they have one almost every single day! I love that they are only 40 calories per bar, so I don't have to feel guilty if I want one too! I really love these little pouches too, much less messy than an ice cream cone or ice cream on a stick! 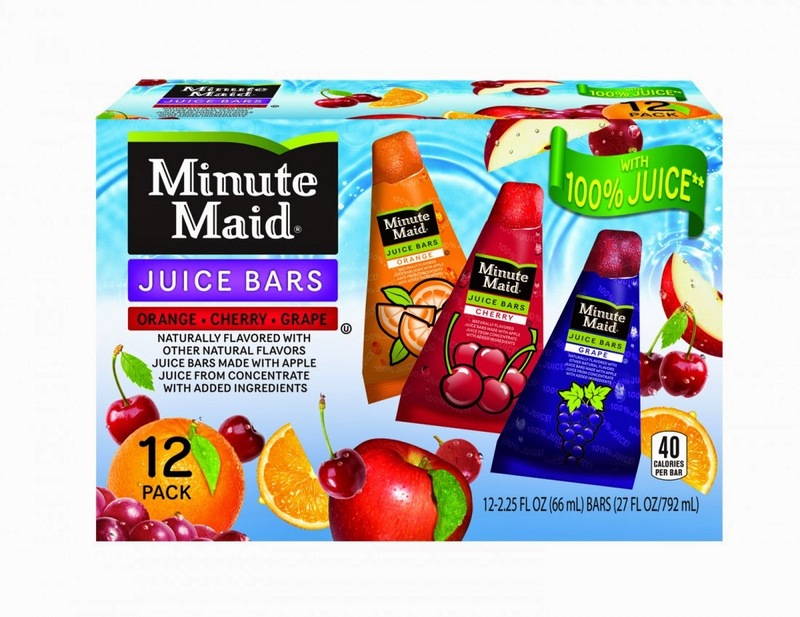 These Minute Maid Juice Bars have definitely been a hit around our house this summer, and the boys are already begging me for more when our boxes run out! I would love to see some more flavors added in the future, just to switch it up a bit, but these three are great classics! Make sure to grab some of these yummy treats the next time you are at your grocery store. You can click HERE to check out all of the other great treats that J&J Snack Foods have to offer! We love these juice bars, and I am sure that you will too!